We reached the holmoak in the Cova da Iria. Once there, moved by an interior impulse, I asked the people to shut their umbrellas and say the Rosary. A little later, we saw the flash of light, and then Our Lady appeared on the holmoak. "I want to tell you that a chapel is to be built here in my honour. I am the Lady of the Rosary. Continue always to pray the Rosary every day. The war is going to end, and the soldiers will soon return to their homes". "I have many things to ask you: the cure of some sick persons, the conversion of sinners, and other things..."
"Some yes, but not others. They must amend their lives and ask forgiveness for their sins." "Do not offend the Lord our God any more, because He is already so much offended." Here, Your Excellency, is the reason why I cried out to the people to look at the sun. My aim was not to call attention to the sun, because I was not even aware of their presence. I was moved to do so under the guidance of an interior impulse. After Our Lady had disappeared into the immense distance of the firmanent, we beheld St. Joseph with the Child Jesus and Our Lady robed in white with a blue mantle, beside the sun. St. Joseph and the Child appeared to bless the world, for they traced the Sign of the Cross with their hands. When, a little later, this apparition disappeared, I saw Our Lord and Our Lady; it seemed to me that it was Our Lady of Dolours. Our Lord appeared to bless the world in the same manner as St. Joseph had done. This apparition also vanished, and I saw Our Lady once more, this time resembling Our Lady of Carmel. In the previous post The Third Secret of Fatima and the Angel with the Flaming Sword, we discussed how the Miracle of the Sun was a symbolic representation of the threat posed by the angel with the flaming sword, which was depicted visually to the children in the Third Secret. But what connects both of these visions to the symbolic importance of Our Lady of Mt. Carmel? As we shall see, the true significance of the apparition of Our Lady of Mt. Carmel during the Miracle of the Sun is to be found in the story of the prophet Elijah's experiences on Mt. Carmel, and how this ties into the account of the Two Witnesses detailed in the Book of Revelation. The primary historical and religious importance of Mt. Carmel is in connection to the prophet Elijah, given that this was the location of the legendary battle between the champion of Yahweh and the prophets of the Phoenician deity Baal Melqart. Indeed, this contest between Elijah and the prophets of Baal appears to have been the symbolic archetype for the battle of Armageddon foretold in the Book of Revelation. 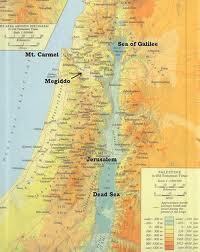 The word Armageddon is derived from the Hebrew Har Megiddo - the "mountain of Megiddo". A curious aspect of this phrase is that there is no "mountain" in the immediate vicinity of Megiddo, which is in fact situated on a plain at the foot of Mt. Carmel. The actual fortress town of Megiddo was situated on a small mound (or Tel) on the plain of Megiddo, strategically located at the head of the Carmel Ridge, overlooking the Valley of Jezreel. The section of hills behind Tel Megiddo (called the Menashe mountains) are actually a lower eastern extension of Mt. Carmel. So Ahab sent to all the people of Israel and gathered the prophets together at Mount Carmel. And Elijah came near to all the people and said, “How long will you go limping between two different opinions? If the LORD is God, follow him; but if Baal, then follow him.” And the people did not answer him a word. Then Elijah said to the people, “I, even I only, am left a prophet of the LORD, but Baal's prophets are 450 men. Let two bulls be given to us, and let them choose one bull for themselves and cut it in pieces and lay it on the wood, but put no fire to it. And I will prepare the other bull and lay it on the wood and put no fire to it. And you call upon the name of your god, and I will call upon the name of the LORD, and the God who answers by fire, he is God.” And all the people answered, “It is well spoken.” Then Elijah said to the prophets of Baal, “Choose for yourselves one bull and prepare it first, for you are many, and call upon the name of your god, but put no fire to it.” And they took the bull that was given them, and they prepared it and called upon the name of Baal from morning until noon, saying, “O Baal, answer us!” But there was no voice, and no one answered. And they limped around the altar that they had made. And at noon Elijah mocked them, saying, “Cry aloud, for he is a god. Either he is musing, or he is relieving himself, or he is on a journey, or perhaps he is asleep and must be awakened.” And they cried aloud and cut themselves after their custom with swords and lances, until the blood gushed out upon them. And as midday passed, they raved on until the time of the offering of the oblation, but there was no voice. No one answered; no one paid attention. Then Elijah said to all the people, “Come near to me.” And all the people came near to him. And he repaired the altar of the LORD that had been thrown down. Elijah took twelve stones, according to the number of the tribes of the sons of Jacob, to whom the word of the LORD came, saying, “Israel shall be your name,” and with the stones he built an altar in the name of the LORD. And he made a trench about the altar, as great as would contain two seahs of seed. And he put the wood in order and cut the bull in pieces and laid it on the wood. And he said, “Fill four jars with water and pour it on the burnt offering and on the wood.” And he said, “Do it a second time.” And they did it a second time. And he said, “Do it a third time.” And they did it a third time. And the water ran around the altar and filled the trench also with water. And at the time of the offering of the oblation, Elijah the prophet came near and said, “O LORD, God of Abraham, Isaac, and Israel, let it be known this day that you are God in Israel, and that I am your servant, and that I have done all these things at your word. Answer me, O LORD, answer me, that this people may know that you, O LORD, are God, and that you have turned their hearts back.” Then the fire of the LORD fell and consumed the burnt offering and the wood and the stones and the dust, and licked up the water that was in the trench. And when all the people saw it, they fell on their faces and said, “The LORD, he is God; the LORD, he is God.” And Elijah said to them, “Seize the prophets of Baal; let not one of them escape.” And they seized them. And Elijah brought them down to the brook Kishon and slaughtered them there. And if anyone would harm them, fire pours from their mouth and consumes their foes. If anyone would harm them, this is how he is doomed to be killed. They have the power to shut the sky, that no rain may fall during the days of their prophesying, and they have power over the waters to turn them into blood and to strike the earth with every kind of plague, as often as they desire. As I explain in more detail in the book, the Apocalypse uses the literary device of recapitulation to add further emphases to key prophetic scenes, and can be better understood when related material is viewed side-by-side, rather than read as a straightforward chronological narrative. 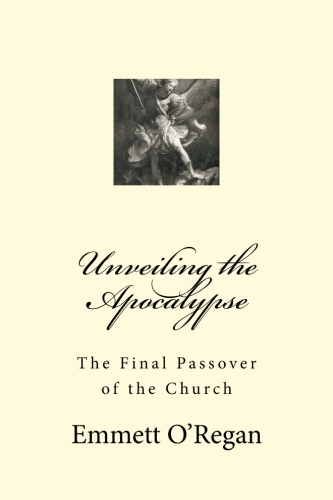 So we can greatly benefit by re-arranging and comparing all the references to the final eschatological battle in the Book of Revelation, to give added insight into the most important prophetic themes. So we can already see the depth of symbolism behind the appearance of the Virgin Mary during the Miracle of the Sun as Our Lady of Mt. Carmel - recalling both the greatest victory of Elijah, and the location of Har Megiddo described in Rev 16, which explains the true nature of the threat posed by the angel with the flaming sword (which in turn is to be identified with the sword that issues from the mouth of Christ in the Apocalypse). When we compare our present situation (which is undoubtedly the Great Apostasy foretold in Scripture) we can see that it has many affinities with the apostasy of the Northern Kingdom of Israel before it was destroyed by Assyria. Yet even though Elijah had managed to bring many Israelites back to the proper worship of God, it was still not enough to prevent the nation from being completely overthrown. On a symbolic level, the drought described in 1Kings reflected the apostasy of the nation of Israel, which was only ended through the victory of Elijah. The end of the period of drought, symbolised by the small cloud coming from over the sea seen from the summit of Mt. Carmel in 1Kings 18:44, represented the efforts of Elijah, who would put in motion a series of events that would eventually re-establish the religion of Yahweh in Israel after it had reached the point of near-collapse. Jezebel, the wife of King Ahab, had vigorously sought to promote her native religion of Phonecia - the cult of Baal Melqart. She incited King Ahab to worship this Baal, and proactively attempted to promote Baalism amongst the Israelites, which she achieved mostly through sponsoring religious syncretism. The situation in the Northern Kingdom of Israel was so desperate that Elijah lamented that he was the only person left in Israel that had not succumbed to the worship of Baal (1Kings 19:14). However his fears were allayed when God informed him that he had set aside seven thousand people in Israel who had refused to worship Baal. Elijah was then given the task of re-establishing Yahwism in the land by appointing Elisha as his successor and ensuring that Hazael was anointed as king of Syria, and that Jehu was anointed as king of Israel. Jehu would then begin a blood-purge which saw the overthrow of the Omride dynasty, and systematically cleansed the land of Baal worship. “Behold, I send my messenger, and he will prepare the way before me. And the Lord whom you seek will suddenly come to his temple; and the messenger of the covenant in whom you delight, behold, he is coming, says the LORD of hosts. But who can endure the day of his coming, and who can stand when he appears? For he is like a refiner's fire and like fullers' soap..."
“For behold, the day is coming, burning like an oven, when all the arrogant and all evildoers will be stubble. The day that is coming shall set them ablaze, says the LORD of hosts, so that it will leave them neither root nor branch." "In the end, my Immaculate Heart will triumph. The Holy Father will consecrate Russia to me, and she shall be converted, and a period of peace will be granted to the world”. As we noted in the earlier post The Two Witnesses, there are many parallels between the Third Secret and the ministry of the Two Witnesses described in Rev 11. The two angels in the vision of the Third Secret appear to represent the cherubim which adorned the Mercy Seat of the Ark of the Covenant. And he shall take some of the blood of the bull and sprinkle it with his finger on the front of the mercy seat on the east side, and in front of the mercy seat he shall sprinkle some of the blood with his finger seven times. Then he shall kill the goat of the sin offering that is for the people and bring its blood inside the veil and do with its blood as he did with the blood of the bull, sprinkling it over the mercy seat and in front of the mercy seat. Thus he shall make atonement for the Holy Place, because of the uncleannesses of the people of Israel and because of their transgressions, all their sins. and will be found no more..."
And when we compare the "great city", the place the "Lord was crucified" (where the Witnesses are martyred in Rev 11) with the location of the vision of the Third Secret - a city half in ruins, with a large cross at the top; we find that they both are describing the exact same place - the Heavenly Jerusalem, which represents the Church itself. The Heavenly Jerusalem is depicted as half in ruins in the Third Secret, in order to symbolise the fact that the Church is enduring the prophesied Great Apostasy in this time period. The desolation of the Heavenly Jerusalem in Rev 11 is communicated in its symbolic names of "Sodom" and "Egypt" - two places which the Bible tells us were destroyed by fire falling from heaven. Then the LORD said to Moses, “Stretch out your hand toward heaven, so that there may be hail in all the land of Egypt, on man and beast and every plant of the field, in the land of Egypt.” Then Moses stretched out his staff toward heaven, and the LORD sent thunder and hail, and fire ran down to the earth. And the LORD rained hail upon the land of Egypt. Then the LORD rained on Sodom and Gomorrah sulfur and fire from the LORD out of heaven. And he overthrew those cities, and all the valley, and all the inhabitants of the cities, and what grew on the ground. Here, the Book of Revelation warns us that the price of the Great Apostasy is the fate of Egypt and Sodom - fire will rain down from the sky and consume the land. But mercifully, the Two Witnesses will bring many back to the faith, before this terrible day of God's wrath. “And the LORD will give salvation to the tents of Judah first, that the glory of the house of David and the glory of the inhabitants of Jerusalem may not surpass that of Judah. On that day the LORD will protect the inhabitants of Jerusalem, so that the feeblest among them on that day shall be like David, and the house of David shall be like God, like the angel of the LORD, going before them. And on that day I will seek to destroy all the nations that come against Jerusalem. “And I will pour out on the house of David and the inhabitants of Jerusalem a spirit of grace and pleas for mercy, so that, when they look on me, on him whom they have pierced, they shall mourn for him, as one mourns for an only child, and weep bitterly over him, as one weeps over a firstborn. On that day the mourning in Jerusalem will be as great as the mourning for Hadad-rimmon in the plain of Megiddo." This reference to wailing at Megiddo alludes to the story of the good King Josiah of Judah, who spearheaded the Deuteronomic Reformation following the discovery of the long lost Book of Deuteronomy during renovations of Solomon's Temple in Jerusalem. So again the theme of a religious restoration is made once again, this time ending in the death of the very person who instituted the revival - just as the Two Witnesses who will inaugurate the Second Pentecost are prophesied to die at the hands of the Beast who rises up from the Abyss. After all this, when Josiah had prepared the temple, Neco king of Egypt went up to fight at Carchemish on the Euphrates, and Josiah went out to meet him. But he sent envoys to him, saying, “What have we to do with each other, king of Judah? I am not coming against you this day, but against the house with which I am at war. And God has commanded me to hurry. Cease opposing God, who is with me, lest he destroy you.” Nevertheless, Josiah did not turn away from him, but disguised himself in order to fight with him. He did not listen to the words of Neco from the mouth of God, but came to fight in the plain of Megiddo. And the archers shot King Josiah. And the king said to his servants, “Take me away, for I am badly wounded.” So his servants took him out of the chariot and carried him in his second chariot and brought him to Jerusalem. And he died and was buried in the tombs of his fathers. All Judah and Jerusalem mourned for Josiah. Jeremiah also uttered a lament for Josiah; and all the singing men and singing women have spoken of Josiah in their laments to this day. They made these a rule in Israel; behold, they are written in the Laments. Given the above combined evidence, it seems that the martyrdom of the Two Witnesses under the auspices of the Antichrist will be the final catalyst for God's judgment on the world. As Zechariah foretold, it is the two "olive trees that stand before the Lord of all the earth" (represented by Zerubbabel and Joshua the High Priest) who cause the "great mountain" to collapse (cf. Rev 8:8). The word of the LORD came to me: “Son of man, set your face against Mount Seir, and prophesy against it, and say to it, Thus says the Lord GOD: Behold, I am against you, Mount Seir, and I will stretch out my hand against you, and I will make you a desolation and a waste. I will lay your cities waste, and you shall become a desolation, and you shall know that I am the LORD. Because you cherished perpetual enmity and gave over the people of Israel to the power of the sword at the time of their calamity, at the time of their final punishment, therefore, as I live, declares the Lord GOD, I will prepare you for blood, and blood shall pursue you; because you did not hate bloodshed, therefore blood shall pursue you. I will make Mount Seir a waste and a desolation, and I will cut off from it all who come and go. And I will fill its mountains with the slain. On your hills and in your valleys and in all your ravines those slain with the sword shall fall. I will make you a perpetual desolation, and your cities shall not be inhabited. Then you will know that I am the LORD. But on that day, the day that Gog shall come against the land of Israel, declares the Lord GOD, my wrath will be roused in my anger. For in my jealousy and in my blazing wrath I declare, On that day there shall be a great earthquake in the land of Israel. The fish of the sea and the birds of the heavens and the beasts of the field and all creeping things that creep on the ground, and all the people who are on the face of the earth, shall quake at my presence. And the mountains shall be thrown down, and the cliffs shall fall, and every wall shall tumble to the ground. I will summon a sword against Gog on all my mountains, declares the Lord GOD. Every man's sword will be against his brother. With pestilence and bloodshed I will enter into judgment with him, and I will rain upon him and his hordes and the many peoples who are with him torrential rains and hailstones, fire and sulfur. So I will show my greatness and my holiness and make myself known in the eyes of many nations. Then they will know that I am the LORD. The Antichrist's deception already begins to take shape in the world every time the claim is made to realize within history that messianic hope which can only be realized beyond history through the eschatological judgement. The Church has rejected even modified forms of this falsification of the kingdom to come under the name of millenarianism, especially the "intrinsically perverse" political form of a secular messianism. The Church will enter the glory of the kingdom only through this final Passover, when she will follow her Lord in his death and Resurrection. The kingdom will be fulfilled, then, not by a historic triumph of the Church through a progressive ascendancy, but only by God's victory over the final unleashing of evil, which will cause his Bride to come down from heaven. God's triumph over the revolt of evil will take the form of the Last Judgement after the final cosmic upheaval of this passing world. We have already argued elsewhere how the flight of the Woman Adorned with the Sun also symbolises the Great Apostasy at the end-time - which links us back to the threat of judgment looming over the world for the mass departure from the faith. Apostasy is always met with destruction in the Bible. The dragon persecutes the Woman Adorned with the Sun, sending forth a flood which threatens to carry her away - which symbolises the apostasy. But the Woman is protected by God, and is given the two wings of the great eagle (which represent the Two Witnesses), so that she can flee to a place of safety. The earth (symbolising the people of the world) then comes to the Woman's aid, and the flood is swallowed up - which signifies the success of the ministry of the Two Witnesses. The dragon then goes off to make war on the rest of the Woman's offspring, which is a prophecy of the final persecution of Christians under the Antichrist - who puts the Two Witnesses to death. The martyrdom of these two end-time prophets of God, who restore the Faith by establishing the Second Pentecost before the coming of the Antichrist, finally results in the promised retribution for anyone who would attempt to harm the Two Witnesses - fire comes down from heaven to consume their foes. This will apparently be brought about by the collapse of the "destroying mountain... which destroys the whole earth" of Jer 51:25, which is one and the same as the "great mountain, burning with fire" of Rev 8:8, which brings about the collapse of the eschatological world empire which is symbolically called "Babylon". As I argue in the book, it the total collapse of America in the wake of the mega-tsunami caused by the collapse of the volcano Cumbre Vieja in the Canary Islands, which will plunge the world into the political chaos that will allow the Antichrist to rise to world dominance. Without the equilibrium established by the "world's policeman", the world of geo-politics will become incredibly volatile. And following the sequence of events laid out in the Bible, it seems that this last great war - the battle of Armageddon, will be brought about by an invasion of Israel - which will be left without the protection of its greatest political ally, and struggling to rebuild in the wake of the eschatological earthquake that is foretold to ravage the city of Jerusalem. It is tempting to propose that this invasion will be provoked by plans for the redevelopment of the Temple Mount complex following this disaster, which would in all likelihood lie in ruins following the greatest earthquake "since man has been on the earth" (Rev 16:18). The surrounding Muslim nations would undoubtedly be furious with any state intervention by Israel on redevelopment plans for the Temple Mount area, which could quite quickly spill over into all-out conflict. But to speculate on this any further would perhaps stray too far from the biblical texts. Whatever the case, it seems that the true significance of the appearance of Our Lady of Mt. Carmel during the Miracle of the Sun, was to confirm that the frightening motions of the Sun on October 13th, 1917, did in fact symbolise the prospect of the destruction of the earth by fire - and that this threat is specifically related to the battle of Armageddon - when the angel's flaming sword will finally fall upon the earth. Hello, after reading your artical,I looked up Mt.Carmel on Wikipedia and found a strange religion I had never heard of, called Babism. The founding of this religion and its teachings seem perfect for Masonic one world goverment, the Twelfth Imam,and the Antichrist. Have you any knowledge of this? Welcome back. I hope you had a restful break. It seems so clear how planet earth has become a great battlefield between the fallen angelic host in which humanity has followed suite after the devil and his angelic hordes (Matt 25:41, Rev. 20:10-15) - the god of this fallen (2 Cor. 4:3-4, Eph. 2:1-3) - he now knows if he can destroy the the family unit that he can put out the Gospel light that has shined forth mightily like none other before it. Once these ends are achieved, nothing will stop Satan from his vain grand design, the global reign and worship of himself under his Anti Christ (2 Thess. 2:3-12, Rev. 13). I believe the key to comprehending the day and hour in which we live is to see things from Almighty God’s HEAVENLY and ETERNAL perspective and to have a close personal relationshiop with Our Blessed Lady. She has a feast tomorrow 22nd August, Our Lady Queen and Mother. Let us re-consecrate ourselves to her maternal care, our life, family, friends and the entire world. The chief question one must ask ourselves in this every changing social climate is, 'Do I have a personal relationship with my Saviour and Creator as the Bible states?' Prayer, Holy Rosary, Sacraments, Holy Hour in Adoration, supporting and praying for our Priests and Bishops and of course God’s infallible Word. Its all here, Let us remember the Good Lord Protects his own, we have nothing to fear. Come Lord Jesus. Mary Our Mother Pray with US! Good to see the blog back in action was getting withdrawal symptoms. Great post Anne, I personally bought the modernist lies and consequently had 2 kids out of wedlock. Now they come from a broken home so I can see firsthand the havoc it plays in their lives. On the positive side of things I had them baptised at the beginning of last year, the ex was quite hostile to the idea and asked them what they wanted (then aged 6 and 4). The older one said she wanted to be baptised and then the ex asked the little one if she wanted to be baptised or not - she just nodded her head as she does everything big sister does. It was the best day! I have heard about the Baha'i faith - it was founded by Baha'u'llah in the 19th century, based on the teachings of the Bab (who founded Babism). The Baha'i faith subsumed Babism, and has around six million adherents worldwide. It's a bit of a mish-mash of various religions based largely on Islam. The Bab claimed to be the Mahdi of Islamic prophecy (as well as Elijah), and prophesied the coming of a "messiah". The vast majority of his followers accepted Baha'u'llah as the fulfillment of this prophecy. I think that people such as these were the "false prophets" and "false christs" warned of by Jesus (Matt 24:24). I didn't know that they had a presence on Mt. Carmel though. The whole "Twelth" or "Hidden" Imam thing of Shia Islam (which is connected to the doctrine of the Mahdi in the more widespread Sunni Islam) is a bit unsettling. If Muslims did hold someone up to be the Mahdi, he would basically fill the criteria of the Antichrist of Christian eschatology. There are a number of books which forward this hypothesis - such as the (rather dodgy) work of Joel Rosenberg. "For behold, from now on all generations will call me blessed"
Thanks for those very heartfelt words Anne. There are so many young people in your situation Jamey - unfortunately this has became the normal way of living, and Christianity is now the counter-culture. It makes it very hard to break free from the cycle of egoism that is engendered in modern society. But your own example shows that it is possible to come back to the Faith despite the pressures of modern living. It's good to hear that you were able to have your daughters baptised! Jamey, your children are Blessed to have a Christian Father who walks resoutely in the ways of God, who prays for them, nourishes them and watches over them. What a wonderful day it must have been when they were Baptised! Well done! 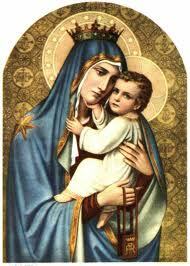 May Our Lord Jesus and His Blessed Mother be always by their side and yours and your Childrens mother. Cheers Emmett and Anne. The ex even found it a very beautiful day in the end. Next is the Eucharistic Lord! Like Joe Russo who once shared his experience on this blog, I also had no choice about re-entering the faith. When the kids pray the rosary that is the best - sometimes they get it wrong saying things like "the Lord is with Me" or "Blessed is the fruit of My womb Jesus". Sometimes when they squabble I make them apologise to their creator, so they say with a breaky voice and sad face "Sorry God". The older one once accused the little one of not being a "real Catholic". They tell their agnostic friends about Mary "our big Mummy in heaven". Pure brilliance. Emmett, why do you think most of the major apparitions in recent times mainly involve Mary and not Jesus? Obviously she has a special role in this eschatological age. Could you imagine this happening 100 years ago. In these latter times Mary must shine forth more than ever in mercy, power and grace; in mercy, to bring back and welcome lovingly the poor sinners and wanderers who are to be converted and return to the Catholic Church; in power, to combat the enemies of God who will rise up menacingly to seduce and crush by promises and threats all those who oppose them; finally, she must shine forth in grace to inspire and support the valiant soldiers and loyal servants of Jesus Christ who are fighting for his cause." Mary is coming to us now to prepare us for the return of her Son, just as she did during the first Advent. Jesus has not appeared in a mass apparition since the ascension. He has only appeared in visions during private revelations - and other occassions such as to St. Paul on the road to Damascus. He will not appear visio sensibilis until His appearance at the Second Coming, when he will bring judgement to the world. It's very interesting to see in your post and example of layers of interconnection and clarification of meaning between Scripture and authentic private revelations are endless. This is particularly obvious in our times when we are no longer dealing only with "texts" or "concepts" but with the world around us. I think its worth not only browsing with curiosity but better yet to read slowly the simple but deep messages filled with wisdom and above all with HOPE from a voice that combines sheer humility with ultimate power and love. The very interesting topics not only of Fatima, but the conversion of Israel, the New Pentecost, etc that you write in several posts are all addressed at the Locutions website. Hope this will enrich your very valuable work. Emmett, went to say thanks for your excellent response a few days ago but my pc crashed at the time, so here goes - Cheers! Anon, there are some interesting locutions there - any idea who the person may be? Some parallels with Emmett's work (eg the Pope being martyred in Jerusalem). If the pope goes to Israel we will be watching with great interest. I've came across some of those locutions before, but I haven't got round to reading them all yet. I'm generally wary of contemporary seers, visionaries, locutionists, etc, since there are a great many which are demonstrably false. But, of course there is also going to be quite a few which are genuine as well, so we should always keep an open mind to those that appear theologically sound, and don't contradict the teaching of the Church. The fact that they are supported by Mgr Esseff is a good sign. Jamey - I'm not too sure that the pope of the Third Secret will actually be martyred in Jerusalem itself, since there is always the symbolic element to this location. The city with a large cross at the top in the secret is definitely Jerusalem, but it also the "Heavenly Jerusalem" which represents the Church itself - and lies half in ruins because of the current state of apostasy. So theoretically, the martyrdom could take place anywhere and still fulfil the prophecy to the letter. That being said, I was deeply concerned by the visit of Benedict XVI to Israel in 2009, one of the days of which was on the 13th May. Sometimes I wonder if the Holy Father was deliberately offering himself to God in this choice of location and date - but thankfully he was preserved to continue with his highly important work. I pray for the protection of the Holy Father during this trip, and that the cup of marytrdom will pass by this pope. It would be deeply unsettling to see such a gentle figure meet a violent end to his pilgrimage on earth.